Is Mobile Banking Safe? Absolutely. You have NOTHING to worry about. Is my mobile device secure to use? I feel secure with my computer. I like to use my computer for my banking activities and I concern over using my phone. Rest assured. Mobile Banking is safe to use! Smartphones such as iPhones & Android have a very controlled and secure operating system Mobile Banking uses 128 bit SSL encryption just like Online Banking – which basically encrypts and protects any transmission of data including customer account information Mobile Banking uses strong Firewalls just like Online Banking – which protects from unauthorized or malicious intrusion Mobile Banking uses your Username & Password for access, just like Online Banking. And just like with Online Banking, your account will lock down after 3 incorrect attempts from your mobile device Mobile banking uses additional Security Q&A authentication for initial access to your account. Why can’t I simply use my computer to access by account? I’m more comfortable with it, and I can just wait till I get access at home. What are the qualifications to have Mobile Remote Deposit Capture? You must have a PrinsBank deposit account opened for at least 90 days and your account must be in good standing. You must also have an iPhone or Android phone with the PrinsBank mobile app installed, a camera in your phone, and an internet connection. Either go to our website www.prinsbank.com and print the Mobile Remote Deposit Capture Application and return to any one of our branches. Or, go to PrinsBank and ask for a Mobile Remote Deposit Application. Your application review and will generally take 1-2 business days for approval. Someone will then contact you at the number or email address you provided on the application with instructions of use. How much can I deposit each day? Our standard deposit limits will allow you up to $3,000.00 per day. Each check must be deposited separately. How should I endorse my checks? Checks must include on the back “MOBILE DEPOSIT ONLY”, endorse and date the check. Failing to do so may result in a denied check image deposit. Customers will be notified via email or mobile number provided on the completed Mobile Remote Deposit Capture Application for any check that is denied. How will I know that my deposit has been received? Acknowledgment that your Check image deposit has been received by PrinsBank does not mean that the check image deposit has been accepted. Users should view the deposit history on your mobile application to view the status of your deposit. Once accepted, the deposit will be processed thru the normal banking channels. If there is a problem with the deposit during processing, the customer will be notified of the issue. Users must check their account history to confirm the check has posted to their account. 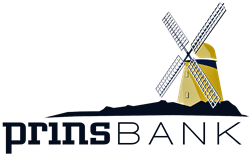 PrinsBank will not send a receipt or notify you that the deposit has been posted. What do I do with the check once it has been deposited through Mobile Deposit? Please retain your check in a safe place for 45 business days after you see the check has been deposited into your account. This is to assure that you have the check until it as gone through the check collection system. Please dispose of the check securely, we recommend shredding. When will funds be available to me after my deposit has been made via Mobile Deposit? Scanning and submitting check image deposit does not constitute receipt of the deposit by PrinsBank. Generally, remote deposits received prior to 1:00 p.m., Central Time are processed on the Business Day of receipt, with funds available the Next Business Day. Any check image received after this time or on Saturdays, Sundays and holidays when PrinsBank is closed will be processed on the next business day. There are no fees for our Mobile Deposit service at this time.